When I’m actually nuts enough to drive down Clement Street in the Inner Richmond, and it’s a lunchtime traffic circus (when is it not a traffic circus? ), I now without fail stop by the curiously non-initial capped little Vietnam cafe (309 6th Avenue, between Clement and Geary). Yep, I’ll actually circle around the block a few times on parking space prowl just to grab the super-fresh, flavorful, and very economical home-style Vietnamese dishes. I was waiting at the JCC to get the 43 Masonic, and I got to use my college Russian translation skills to slowly read outloud like a small Russian school child (I wish!). 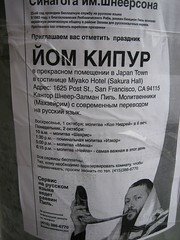 I think it says: Service in Russian with Cantor Peel. It’s not too late: at 6pm is the service, and there’s more tomorrow. Good news, folks! Just this afternoon, the mail collection box that vanished has been replaced! After my last update I created a flyer with information on who to contact at SF USPS and gave the flyer to a worker at the Senior Center. She said that the seniors had been calling different numbers and this one contact number would be very helpful. Located near USF at 798 Arguello Boulevard at the corner of McAllister, the bicycle-themed Velo Rouge Cafe is popular with USF students and neighborhood residents. There always seems to be a good mix of people during the day: coeds, professionals, and parents with kids. As expected by the name, a fair amount of bicylclists stop by, locking up their bikes on the bright red bike rack out front. The owner has created a good, comfortable neighborhood cafe that entices the Golden Gate Park-goers, as well. After a few visits on my own, and enjoying the coffee and the espresso drinks, I brought my wife and daugther there on a recent Saturday morning to try their nibbles as well. For four nights over the Labor Day Weekend, this RV eyesore and its occupants were parked across the street from our flat, next to the park. Usually, as my wife reported to me from her observations, they are parked across the street from the Safeway at the end of the continent. After observing some regular visitors to the RV, as well as a Sunday police event at the Muni stop in front of the Senior Center, which somehow involved the seemingly lone female inhabitant of the RV and two males, I finally decided to call the SF Police. Thanks to Tharpo for sending this to me today. She got it in her district email newsletter. Yeah, we’re crime-patrol geeks. Dynamic map of homicides in SF from 2004, 2005. As of the time I wrote this the Geocities link wasn’t working- for the active Google-maps version. SFGate article here. Down at Land’s End, they found, in a treehouse, the remains of an elderly man. It was about a year old. There was no skull. I have to say, sounds like a nice place to spend your last moments, if it was a natural death. My friend lives a few blocks from there, and whenever I visit at night at least, it has a spooky kind of “end of the world” feeling, apt for its name.